Brad Taylor (ABJ ’83) is a 23-year veteran of the Coca-Cola Company with extensive sales and marketing leadership experience. Most recently he served as vice president of sales & marketing, national accounts in the Foodservice and On-Premise Division where he led cross-functional teams to deliver over $500 million in revenue from existing national account customers, as well as secured new business in the foodservice, travel, healthcare, and specialty retail sectors. 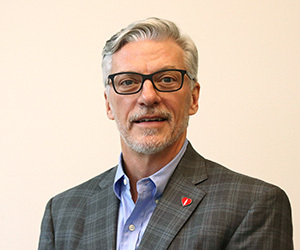 Earlier in his Coca-Cola career he served as vice president of customer marketing where he led a team of marketers to consult top 100 customers in the areas of brand strategy and positioning, marketing strategies, and integrated marketing campaign development. Before Coca-Cola, Brad gained extensive brand management and marketing experience at Pizza Hut, Inc. as well as advertising agency account management experience at Bozell, and The Joey Reiman Agency. Brad has parlayed this vast experience into his own branding, marketing, and sales strategy freelance consultancy, TaylorBuiltBrands where he helps clients polish their brand and solve their marketing and sales challenges to build their business. Brad is a skilled orator and facilitator and passionate about public speaking, consulting, advising, training, and teaching others who can benefit from his vast experiences and knowledge gained throughout his career. He currently serves as a part-time faculty member at the Goizueta Business School at Emory University, at the Coles College of Business at Kennesaw State University, and at Grady College, his alma mater. He is also passionate about giving back to his community and currently serves on Executive Advisory Boards for both Grady College and Coles College of Business at Kennesaw State University. He serves as a mentor with the Atlanta chapter of the American Marketing Association. Brad is teaching advertising and communication management classes in the Department of Advertising and Public Relations.